Good southern girls aren’t afraid of the dark. Neither are good Canadian girls for that matter. BUT. I think people with really good imaginations (like moi) should be given more credit for doing even SLIGHTLY scary things. Like taking my dog for a walk after dark in my new (country) neighborhood. It’s not like we’re the only people for miles or anything but, the dark here, it’s deeper than city-dark. And quieter and noisier at the same time. No sound of cars or horns or sirens but the crickets are a little scary. Especially when it isn’t the nice soothing two or three I used to hear. It’s not a relaxing chorus of crickets, it’s an ARMY of them, all singing with their weird little legs about how to eat me down to my bones. See? I should get more points for kind-of scary when my brain turns it into a horror movie every time. Saturday night I took Toby out for a walk in a thunderstorm. Thunderstorms didn’t look like this in Virginia. For one thing, it always rained when there was thunder and lightening there. Not so here. The sky growls and you aren’t sure if the lightening is coming from the ground or the sky, it’s kind of everywhere, all at once. And there’s no rain. Its like the sky is trying to pee but it’s having a really hard time. I took Toby for a walk and I kept remembering the conversation about lightening Bill and I had the night before. (It also storms a lot more here). Me: (watching the storm clouds roll over the Home Depot building). Bill, are you ever afraid of getting hit by lightening? Bill: Of course not. Of all the billons of people on the planet only a few get hit by lightening every day, what are the odds I would get hit? Not very high. Me: Yeah, but it DOES happen to someone, somewhere. Bill: It’s so unlikely there’s no point in being afraid. Me: Ah huh. (remembering all the weird stuff that’s happened to me in my life that ‘never happens to anyone’…) SOMETHING happens to SOMEONE ALL THE TIME! Wake up people!! So anyways I didn’t get hit by lightning Saturday night while walking the dog. But I should get more credit for it because I could imagine what it would FEEL like to get hit. A sharp SNAP and the smell of burnt hair. Also, lastly, I’m afraid of opening the door to go outside in the first place. Inside is bright and clean and safe. Outside is dark and noisy with insects and animals I can hear but can’t see. Not that I’ve glimpsed anything capable of taking down a grown woman. (Or me). All we’ve seen so far is deer. A LOT of deer. 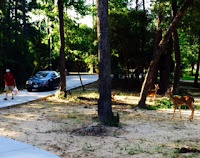 Deer everywhere, all the time, back yard, front yard, driveway, all around the neighborhood. The DISH guy said there has been an explosion of the hog population here recently and have we seen any. (!?!?!?!?) Apparently they were ruining the golf course he went to so they let the maintenance people take them home and eat them if they could catch them. (Using guns inside city-limits!? Using rakes and lawn mowers!?) I didn’t ask. It IS Texas after all. Any option is possible. I found a few golf balls around the house and I had to add ‘getting hit by a stray bullet intended for a hog’ to my list of things to be afraid of. My life just got ten shades weirder from yesterday to today. What will tomorrow bring!? So, anyway, here I am. Afraid of the dark again and reminded that the world is bigger, badder, cooler, more magical and interesting than we know. It just takes us getting out of our ruts, our routines, maybe our houses or our towns to see a different side of life. Not that I would move just for the change in perspective but, if the opportunity arises for you, I say take it. Life is short. I don’t want to just live the length of my life but the breadth of it as well. Someone smarter than me said that. I’d like to give them credit but I can’t remember who it was and they’re probably dead anyway. Probably got hit by a stray rake in a terrible hog-hunting accident. Or eaten by a swarm of crickets hungry for human flesh. Or got hit by lightening and had cardiac arrest in the driveway after supper while walking the dog. Her last dying moments spent wishing she’d eaten that extra piece of strawberry shortcake. Eat the dessert. Take the opportunity. Try not to get eaten by crickets. Catching hogs on a golf course? Sweetie, he was either pulling your leg or YOU HAVE MOVED MUCH TOO FAR AWAY FROM CANADA!!! Wild hogs are not your everyday pig. They are mean and viscous and they are mainly in the woods. Sweetie you make me laugh. You have a way of taking everyday things and making them funny. Imagination is the source of inspiration,so imagine on. You are too far away, but I digress.